Error While Encoding Movie & Menu? Running Windows 10 with Creator NXT3. Created a project in MyDVD which plays fine within Roxio. When attempt to burn to DVD continually get 2 the error message: 8004520C (Error Encoding Movie 1) & 80070000e (Error while encoding menu). . How do I address / fix the error. Is there a limit to the number of menus in a project? Appreciate any help. Thank you. There can only be one menu ! There can be submenus. How much video time are you putting on a DVD -- 60 minutes is max for best quality on a single layer disc. Did you do a clean install with nothing else on your hard drive or a dirty install over a previous Windows version. Thx for your suggestions - nothing worked. I removed the movie and now am getting error 80004520C error while recording slideshow???? I have an AMD 6Core 4G processor, 16 gig of DDR3 memory, lots of space on hard drive running Windows 10. To my knowledge all my drivers (especially video card) are up to date! Project only has one menu with 7 sub-menus No way total project exceeds or come close to the 8 Gig DVD's storage capacity. Any suggestions? FORGET THE 8G ! Remember the one hour for single layer DVD and a little less than 2 hours for a dual layer, If you are using anything other than mpg2 files, they need to be converted to that format and thus increase the size of the project. When was the last time you updated the drivers for your video card? They don;t automatically update unless you tell it to. That is why I asked for the dxdiag evaluation of your computer in my post above. You did not attach it. There is no persona information other than the name of your computer if posting the information is a problem for you. Tell us more about your submenus. How many video are you trying to put onto the disc? What menu template are you using. Most menus allow about 4 items per page - 7 submenus by 4 = a lot of individual videos or chapters. Try this, it will add a little of your time to creating the DVD. In Video Wave, add the slide show )or just open it). Select OUTPUT and then select mpg2 (I assume that you are not trying to create an AVCHD disc or a blu ray). Wait until the output is finished. If it finishes, you can just add that to your DVD project. If it does not finish, then there is something wrong in the production. If you watch it, you can see about where there is and error in the slide show. You should be able to correct it. If this is an important project, do this for all the individual projects so you have mpg files to add to the DVD. Since they have already been made compatible, they should not cause a hang. From myDVD, output to an ISO file so that your computer works on only one thing at a time. When you have the ISO file, burn that to your DVD using the application on the Home page.. Thank you for your suggestions. I can now create an image (ISO) and/or burn the DVD from the project. I have a main menu, 6 submenus deep. I can run each of the 23 menu options (slideshow / movies) with no problems.The total project is less than 4Gig (per Roxio). I can burn the DVD, either from the ISO or direct from the saved project. However, at the same spot it stops recording the images (photos) and I get a black screen. It continues to record the timeline until the end of the project. I think it is a virtual memory issue!! Any suggestions.??? There is an incompatibility in your project. Did you render each of the projects separately and then add those mpg2 files separately? I added / created each "movie" / slideshow within the same project. To my knowledge using the same process / procedures. I'll look more closely at where it degrades to see if there are different parameters / settings. Did you create the movies and slideshow using Videowave and output them to a mpg file and then add those files in myDVD? This is the recommended way of authouring a DVD since it separates the rendering from the burning. Where do you get the "project size" of less then 4GB. Generally file size is not important, it is the length of time of your project that matters more. Can you prost a screenshot of the menu structure? I created a project using My DVD, then added a movie ---> added pictures per each subject. 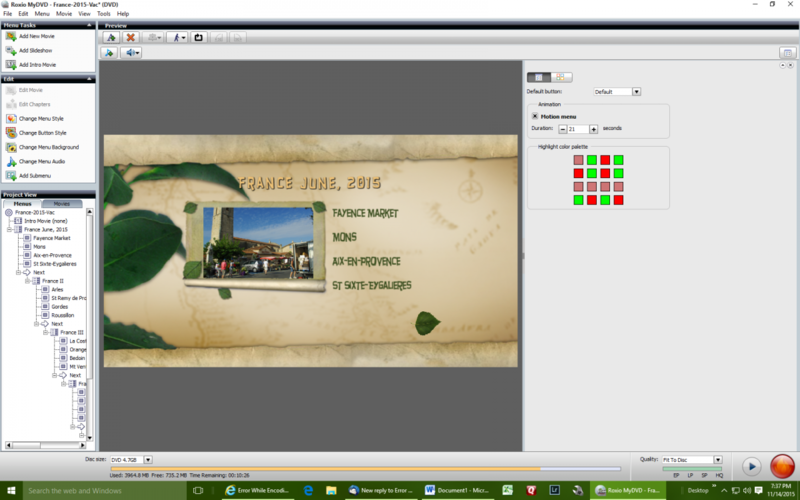 Roxio automatically created a main menu with sub-menus, attaching the slide show to the menu option. I would then edit the move to add transitions between the slides. This is not correct? I've tried to enclose the My DVD snapshot but it says I'm not permitted to upload this kind (?) of file.???. Attached screen snapshot of my project. How long in time is your project? A standard 4.7GB DVD can only hold 60 minutes of video using the best quality. Any longer and the video gets compressed even more and you lose quality. Also if the the video is >60 minutes and you use the "fit-to-disc" setting, you are using the worst possible setting. It often creates the black screen that you are seeing. Thank you. Made the change, but the same result at the same slideshow. Still can't determine where the incompatibility is! How long in time is your whole project? You didn't do what I asked you to do in post #12 and post the screen shot!